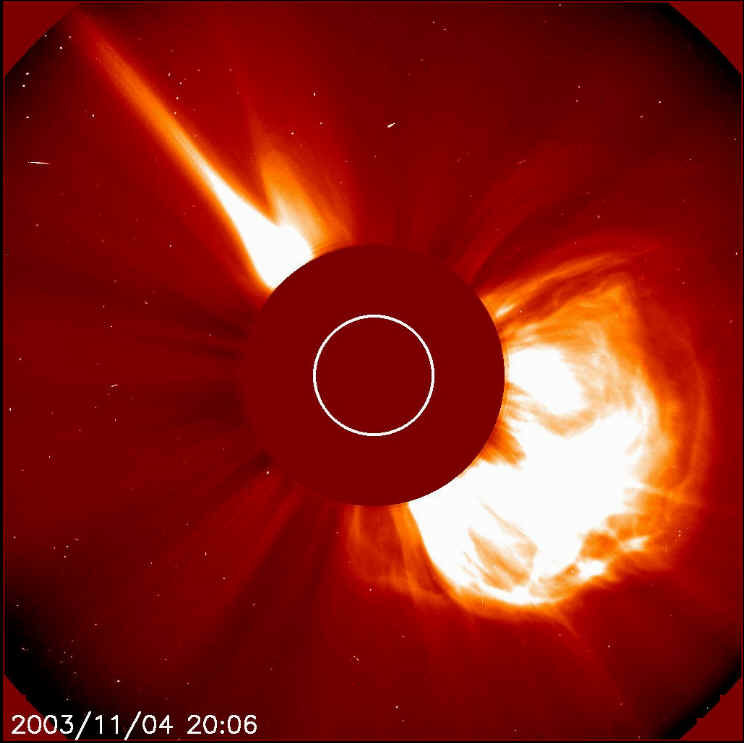 On 4 November 2003, The Sun's active region 10486 blasted off yet another mega-flare, starting at 19:29 UT on 4 November 2003.The SEC that their best estimate was X28, with a peak around 19:50 UT. Although the exact number will likely be debated for some time, it is now official: We have a new #1 X-ray flare for the record books. Before the storm peaked, x-rays overloaded the detectors on the Geostationary Operational Environmental Satellites (GOES), forcing scientists to estimate the flare's size. Taking a different route, researchers from the University of Otago used radio wave-based measurements of the x-rays' effects on the Earth's upper atmosphere to revise the flare's size from a merely huge X28 to a "whopping" X45, say researchers Neil Thomson, Craig Rodger, and Richard Dowden. X-class flares are major events that can trigger radio blackouts around the world and long-lasting radiation storms in the upper atmosphere that can damage or destroy satellites. A massive solar flare erupted from the surface of the Sun at 9:51 UTC on October 28, 2003. The solar flare persisted for more than an hour, peaking at 11:10 UTC. Associated with the flare was an ejection of a billion tons or more of gas from the Sun’s tenuous outer atmosphere, or corona. Both the flare and the coronal mass ejection accelerated electrically charged particles to very high energies and hurled them at near the speed of light directly toward the Earth. It takes light roughly 8 minutes to travel from the Sun to Earth, and these particles made the trip in less than an hour. 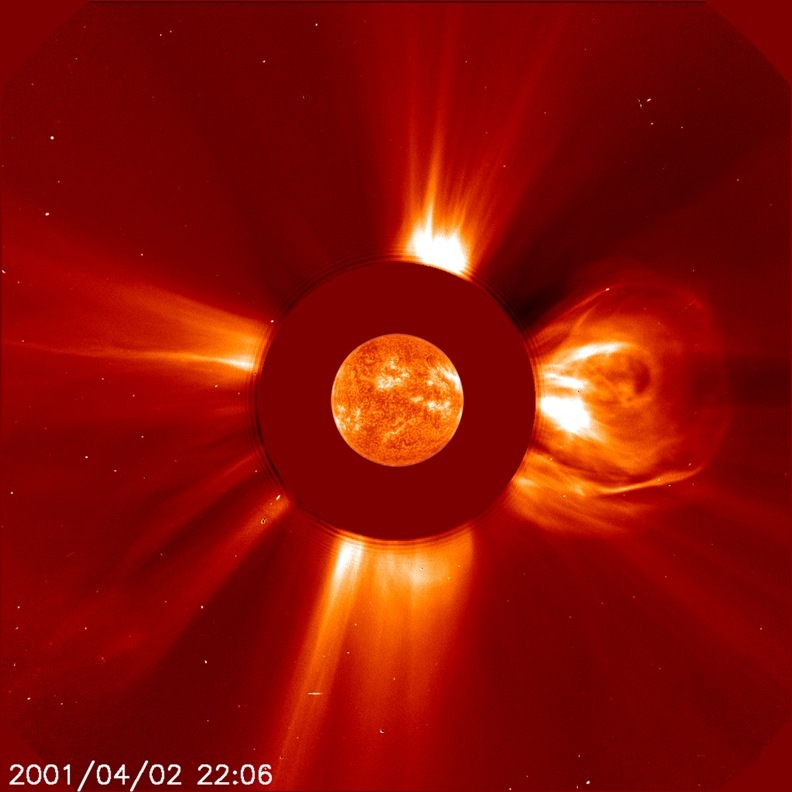 At 4:51 p.m. EDT, on Monday, April 2, 2001, the sun unleashed a solar flare , as observed by the Solar and Heliospheric Observatory (SOHO) satellite. The flare was definitely more powerful than the famous solar flare on March 6, 1989, which was related to the disruption of power grids in Canada. 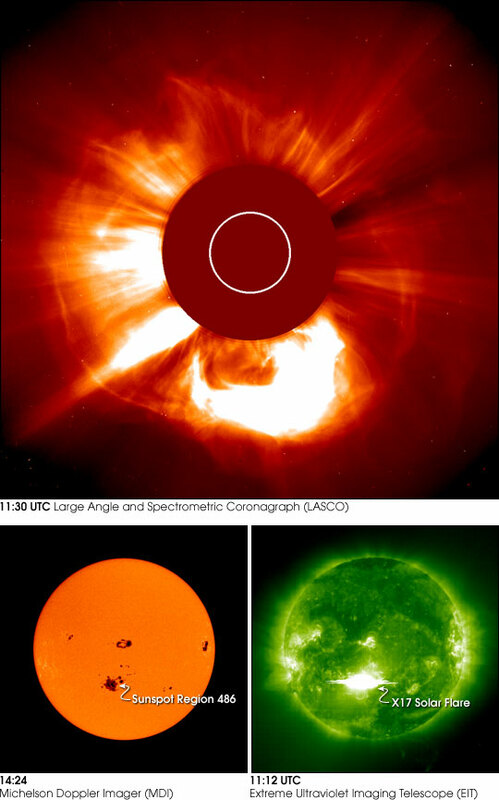 This recent explosion from the active region near the sun's northwest limb hurled a coronal mass ejection into space at a whopping speed of roughly 7.2 million kilometers per hour. Luckily, the flare was not aimed directly towards Earth.